Came to a dead stop on my street as it was filled with turkeys. No doubt without fear now that Thanksgiving is over they were getting a free meal from a lady that put something out for them. What could that be? Stuffing? Click on the image for a larger view of this photo. Made a quick trip into town and found this guy looking up into the clear sky on the First Hawaiian Bank building. 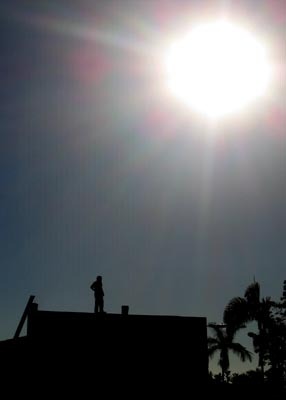 Guess he was done with his job up there and was enjoying the view. The reason my trip to town was quick is because I’ve caught a cold (hopefully not the flu). 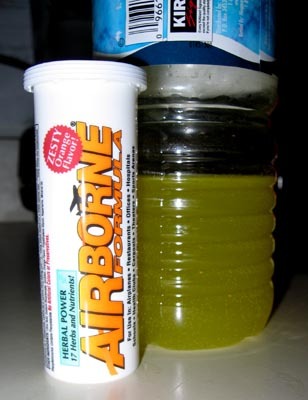 Been drinking some of this Airborne stuff that I bought for my flights to/from the mainland as it’s also supposed to be good for colds. Started feeling something was going downhill yesterday before the workshop and last night I knew I had caught a cold or something. A nice headache and some sinus problems. I had stopped taking my echinacia/goldenseal about a week or so ago to give my system a rest, I should have kept taking it as I never get a cold while on it. Damn, too late. Today another headache and made chicken soup for lunch, maybe I should have had fresh turkey soup. And now starting congestion and a sore throat so I switched to herbal tea. It’s 10:35pm and I’m going to sleep, which means I’m going to sleep early. g’nite.